Stir fried cabbage and pork may not be the most photogenic meal I have made, but it is delicious! I recently bought a wok. I am going to post about it more soon. I want to use it a few more times before I give it a full review. So far I am loving it though. My wok came with a small recipe booklet like many small appliances and kitchen tools do. Often times I just toss these in the trash, but I was curious about the wok recipes so I took the time to look through the booklet of recipes. One of the recipes that came with it was for a Chinese cabbage type of stir fry. I found the recipes interesting, but it called for several ingredients that I did not have. I am sure the recipe was great, but I am a big believer in using what I have on hand. Yes, I will splurge and buy an occasional specialty item, but the best way to keep your grocery budget under control is to use what you have instead of running to the store all the time. At the time I had a large amount of shredded cabbage in my fridge. It was not the Chinese cabbage the recipe called for, but I thought it would work fine in the recipe. Yes, it would taste and look different, but it would work. And not only would it work, it would help me use up the cabbage and keep it from going to waste. So, I tweaked the recipe quite a bit to come up with my own version. It ended up being delicious. Even though it was quite a bit different from the original recipe, and I am sure far from authentic, it was delicious. My family loved it and told me I needed to make it again. What I loved about this meal was how quick, easy, and healthy it was. 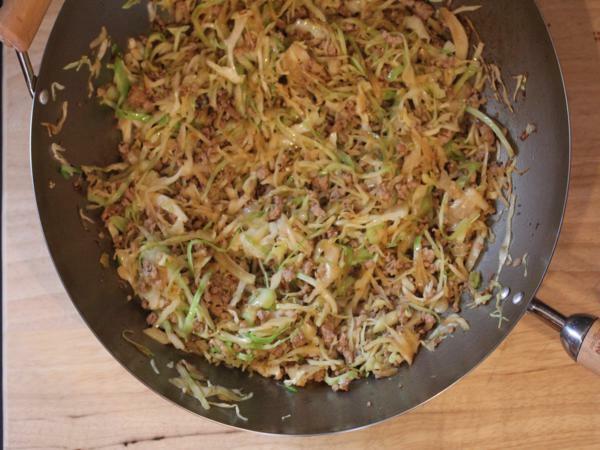 Stir fried cabbage and pork will definitely be on the menu plan again. Now I will say that my daughter and I are not big cabbage eaters. My husband and one of my girls love it, but I can usually do without it. This recipe though was delicious. Both my daughter and I really enjoyed it. It had enough flavors going on that we did not mind the cabbage at all, in fact we really liked it. 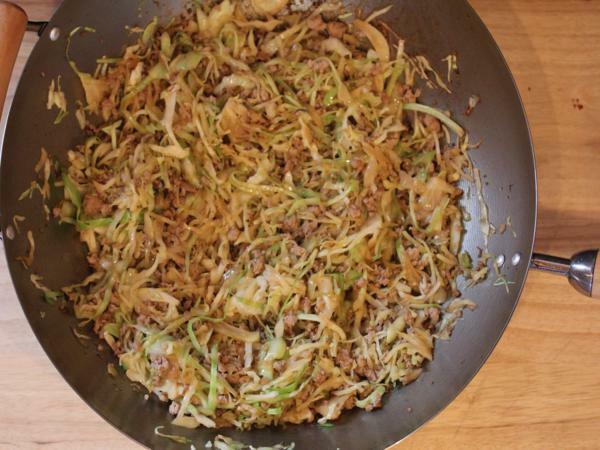 So, if you don’t normally enjoy cabbage this is a recipe you should give a try. In a bowl combine sugar, soy sauce, and rice wine vinegar and set aside. In a large pan or wok cook pork until browned and done. Remove from pan and drain off any fat. Set meat aside. Heat oil in the pan and add cabbage. 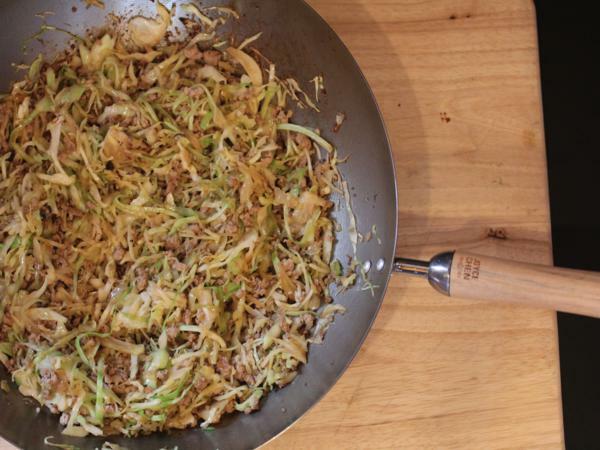 Stir fry for 2-3 minutes or just until cabbage starts to get tender. 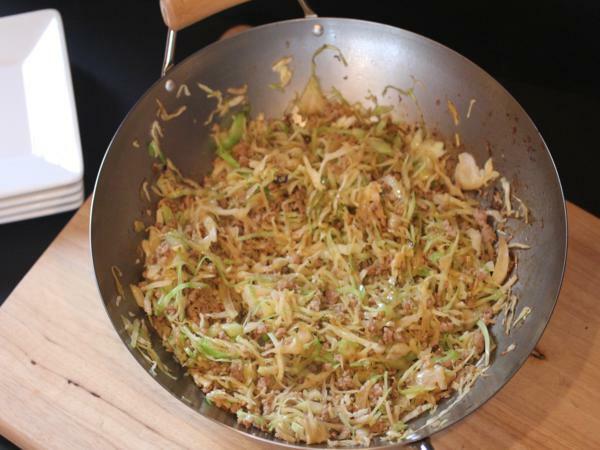 You don’t want to over cook the cabbage, you want it slightly tender, but still slightly crisp. Add sauce and ginger. Stir a few times and add meat back to pan. Stir a to combine well and remove from heat. Stir frying is so quick and easy! Last night I made a version of Jane Brody’s Beef Lo Mein with what I had on hand and stir fried the strips of beef, then the vegetables, before combining both with cooked noodles and Jane’s “3,2,1” sauce. I have a “Chicken-in-the-Garden” stir fried recipe that I developed myself if you would like to have it by email or comment post. Quick and easy is why I love stir fry too. The beef lo mein sounds delicious! I would love the ‘chicken in a garden” recipe Teresa Rouzer!! It may not look beautiful, but that doesn’t stop me from wanting it. Sounds AMAZING to me! we made this for Sunday dinner with cabbage I needed to use up. While I was cooking..everyone was saying “we are having cabbage”? the frowns turned upside down and they gobbled it up and even asked for seconds. My husband wants to grow cabbage now. Thanks for recipe, it was YUMMY! I am glad your family enjoyed it! I am so glad you now have a way to enjoy cabbage! How timely that you would post about your wok and I would see this recipe linked there! A friend is running for local office and we helped with a fish fry/campaign kickoff party this weekend. We had lots of cole slaw ingredients leftover and we all brought home 2 gallon bags of chopped cabbage, onions, peppers, carrots. The catering lady told us that we could keep it in the freezer for making stir fry. I’ll be using mine to make YOUR recipe. Thanks again! You are just a wealth of information, lady! I’ve been thinking more and more that high schoolers ought to have to be required to take home ec (now called Family & Consumer Science in our area) and your blog would make great curriculum for the class. Some kids these days don’t even have any mentors to show them how to feed themselves or their future families and your blog would fit the bill. Thanks for all the good posts! I hope you enjoy it! I think it is a great way to use up extra cabbage. Thanks for letting me know how much you enjoy my site and recipes. I appreciate it. Thanks for reading! How much cabbage? Did you buy cole slaw or chop it like that? Never mind!! Just reread it! Lol! This looks yummy and I plan on making it this week, but I’m curious as to what you usually serve as a side dish…? Thanks! I usually serve some sort of vegetable, like roasted broccoli, with it or sometimes rice with it. I have also just served it as a meal all by itself. It really varies what I serve with it. I made this tonight and served it over spaghetti noodles. Made it like a Lo Mein. Very good! This was very good. I saw your post on facebook and used what bits of this and that were left in the fridge and we both enjoyed it for a very nice lunch. Keeper and will be added to the book of favs. Thanks. I am so glad that you enjoyed it! It is one of my favorites. This is one of our favorite dinners – my nine-year-old is making it right now! I am so glad that you enjoy it. I think teaching kids to cook is important so I love hearing that your nine year old makes this!